Freshmen are always excited to bond with the wonderful people they meet in their first few weeks here at JMU, and many times these people will become their lifelong friends. However, freshman year is a time of change, and it’s hard to know everything you need to know about a person after only a few weeks, or if they’ll still be that person at the end of one of the most influential years of their life. For this reason it’s important that you don’t rush into signing a lease with people they’ve only been friends with for a few months. That’s why Off Campus Life (OCL) wants to emphasize all of the reasons that you should Take Your Time Before You Sign. In addition to being careful about picking roommates, it is also important to make sure thorough research has been done before picking a housing complex. Many complexes will offer incentives to sign early, stating that property is going fast and that you must sign in order to ensure that you have a place to live. The fact is, most places will still have vacancy come springtime.There are more options for housing than there are students who want to live off campus, so finding a place to live will not be an issue no matter how long you wait. There are lots of ways to research housing options. 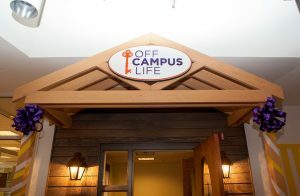 OCL has an open door policy, and is located on the first floor of Festival. Students may come in anytime to discuss what housing could be best for them. Students may even discover that living on campus a second year could be a great option if they aren’t ready to deal with cooking and keeping of a whole place themselves. They could also discover that applying to be an RA would be a great living option for them, giving them leadership experience and affordability. Location is another important part of looking for an off campus living situation. Many freshmen sign without having a real sense of where things are within Harrisonburg, and without being fully familiar with the area they are committing to live in. OCL offers a map in their housing guide which can be accessed through their website. While the 2018-2019 guide is not yet out, the 2017-2018 guide offers relevant information for those who want to begin researching. Just spending a few more months in Harrisonburg will help you become more oriented with what the location of their housing complex will mean for getting to campus, getting to food, etc. With all of the insanity that comes with first semester freshman year, students should think twice before committing to a binding lease that could land them in a less than optimal living situation. Do research, come into the OCL office, take housing tours, and Take Your Time Before You Sign! FSL Hosts Annual Trick or Treating on the Row Tomorrow!